An easy-to-upgrade design and solid performance hide under the mild-mannered exterior. Back in the day, Dell’s XPS desktops were fire-breathing gaming machines. They could take on the best from Falcon Northwest, Alienware, Origin, and the rest of the “money is no object” boutique builders. Judging by the redesigned XPS Tower Special Edition, Dell remains committed to that division between its brands. Instead of an all-out battlestation, this refreshed XPS offers a rock-solid gaming experience that runs coolly and quietly in an extremely understated design. The big news with the XPS Tower Special Edition is its retooled chassis. The frame is now 27 percent smaller than the previous one, measuring just 15 inches tall and 14 inches deep. Dell’s achieved this shrinkage by moving some of the drive bays and putting the power supply over the CPU area. Despite the tight design and single case fan—a 120mm spinner that sits atop the system at the back—airflow doesn’t seem to be an issue. (Skip ahead to the “Acoustics and thermals” section for how the machine performs during stress testing.) Tinkering with the system’s hardware is easy, too. 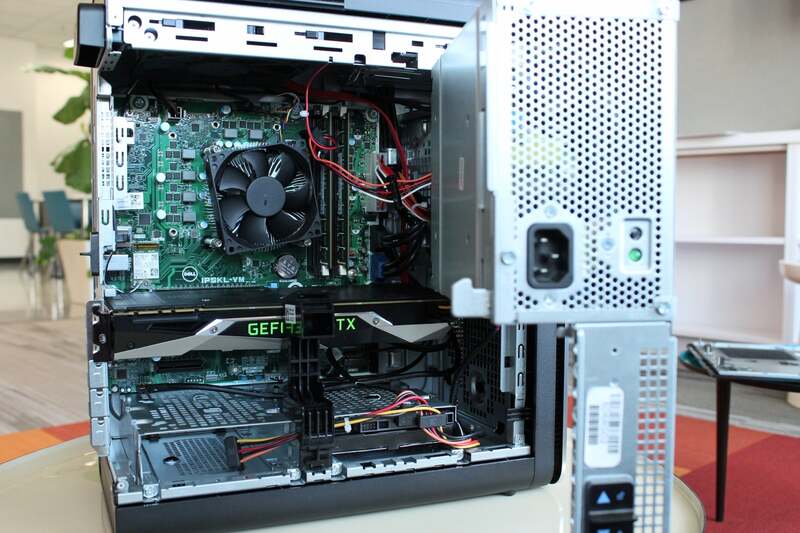 When you pop off the side door via an easy-to-pull hinge on the back of the system, you can see two things: the power supply assembly and the GPU. If you pull on two more latches, you can release the power supply, which is attached to an arm that swings out from left to right. Getting access to the CPU is as simple as moving the PSU and its metal assembly out of the way. For later expansion, you get just two empty 3.5-inch drive trays: one on the bottom of the chassis, and one that attaches where you’d normally expect a front intake fan. There’s also M.2 slot on the motherboard that supports PCI Express. In exchange for the limited number of bays, the system can handle up to 10.5-inch GPUs—or nearly every high-end video card available. A notable exception would be the Titan X Pascal, but given that the included power supply is 460W, you wouldn’t be able to support one on the included PSU anyway. The 225W limit for the GPU via its dual six-pin PCIe power connectors is enough for a GTX 1080 (which has a TDP of 180W), but it’s not enough for a Titan X (TDP rating of 250W). On the back of the machine is a bank of four USB Type-A ports; three of which are USB 3.0 and one is USB 3.1, and there's another Type-C USB 3.1 port next to it as well. Additionally there's one gigabit LAN port, two USB 2.0 ports, and audio jacks. The front of the PC features four more USB 3.0 ports, an SD card reader, headphone/mic inputs, and a super-slim optical drive. The only thing missing is a USB-C port, but given the current state of USB-C implementation, you won’t need one just yet. 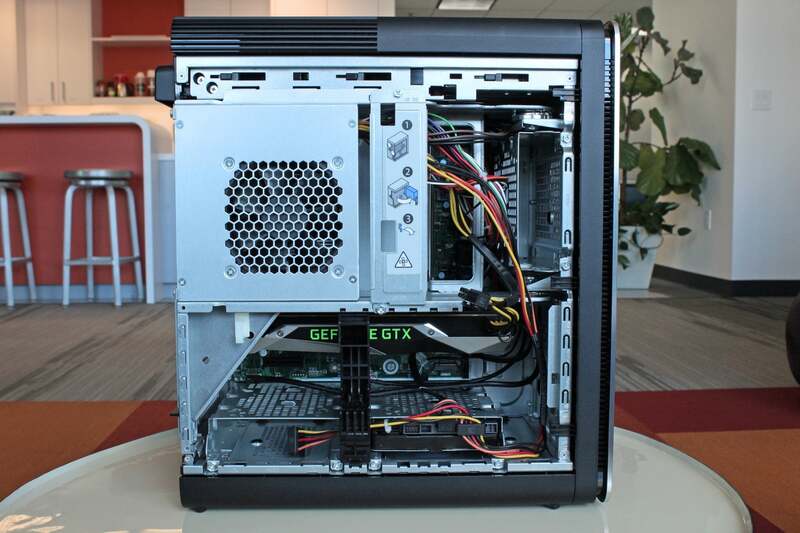 Two versions of this computer exist: the XPS Tower and the XPS Tower Special Edition. The two models look the same visually aside from the color of the diamond-cut faceplate: The standard version's is piano-black, while the Special Edition's is gray. Of the two options, the Special Edition (the model we’re reviewing) is the only one that offers high-end CPUs and GPUs, and thus the only version suitable for high-end gaming. For example, the Special Edition offers the option of an unlocked Core i7 K-series processor that you can overclock in the BIOS, while the regular version offers only locked processors. You can upgrade to a GTX 1070 or GTX 1080 with the Special Edition, while the standard model restricts you to a GTX 960 or worse. All in all, you get a processor with four cores and no Hyper-Threading that runs at a 2.7GHz base clock with a 3.3GHz boost clock, plus sufficient RAM and a fairly spacious storage drive. 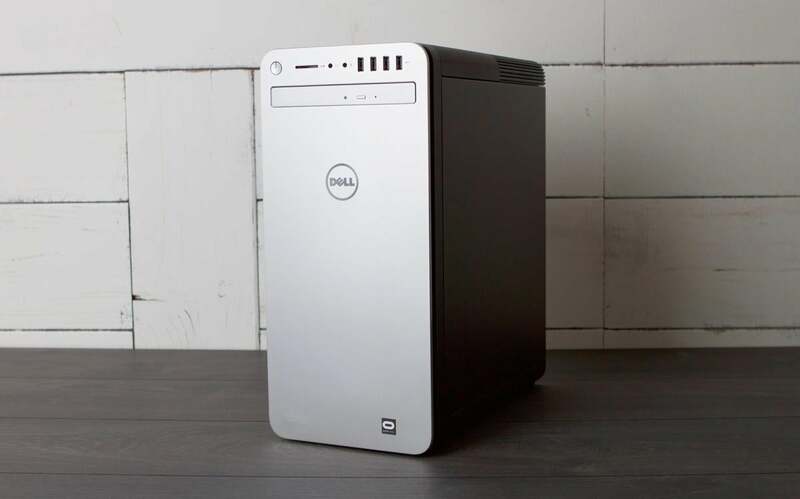 Dell offers three other primary configurations of the Special Edition, each further customizable, so if you have your heart set on a faster CPU or graphics card, more memory, an SSD, or a bigger hard drive, you can have it. Just be ready to dole out a lot more cash: The highest-end config starts at $1,900. With a mid-range Core i5 CPU and GTX 1070, the Dell XPS Tower Special Edition is a decent gaming machine (especially given its price). Its hardware does have some limitations, however, which are especially noticeable when compared to PCs with Core i7 chips. Overall, though, it still provides a mighty fine experience. Let’s dig in. 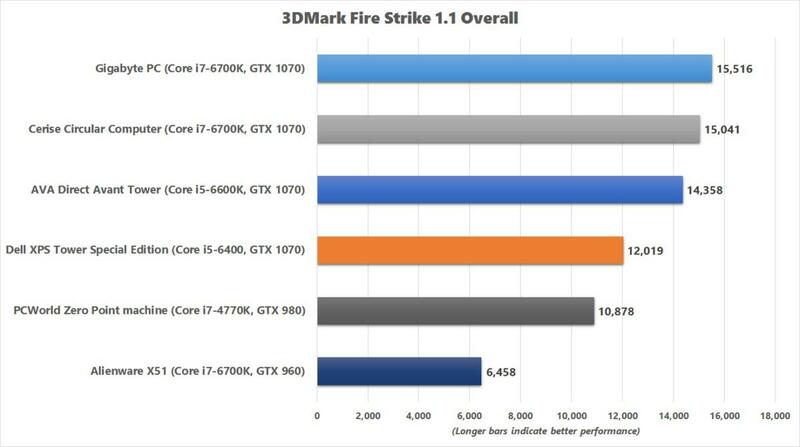 Because the XPS Tower Special Edition is meant for gaming, we hauled out 3DMark’s Fire Strike as our first benchmark. It’s a synthetic test that everyone knows and loves because it scales well and does an excellent job of replicating real-world results. It also takes into account both CPU and GPU power, which reflects clearly in this Dell desktop’s results. Though the XPS Tower has a stock GTX 1070, it didn’t perform quite as well as the other GTX 1070 systems we’ve seen. Its mid-range Core i5 processor constrains overall performance—relative to the top dog in our comparison, which paired a swift Core i7-6700K with a GTX 1070, the XPS Tower was 22 percent slower. 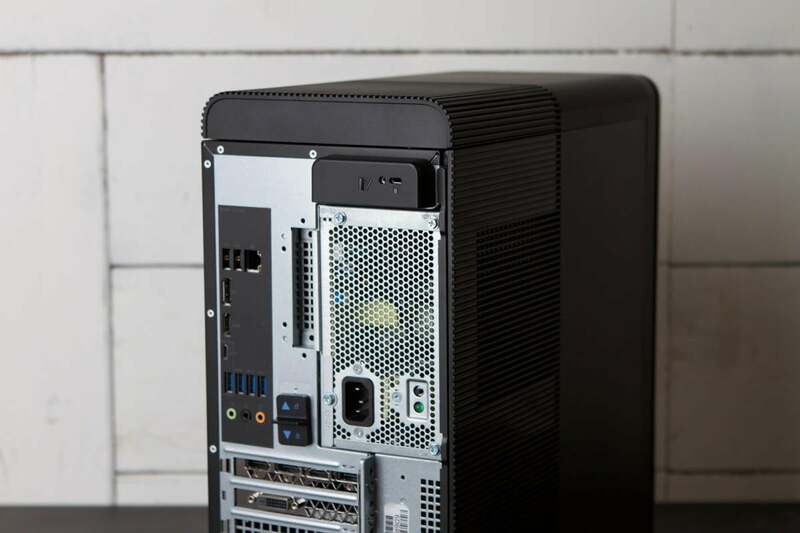 Even AVA Direct’s Avant Tower, which uses a mini version of the GTX 1070, outperforms this Dell desktop thanks to its speedier CPU. 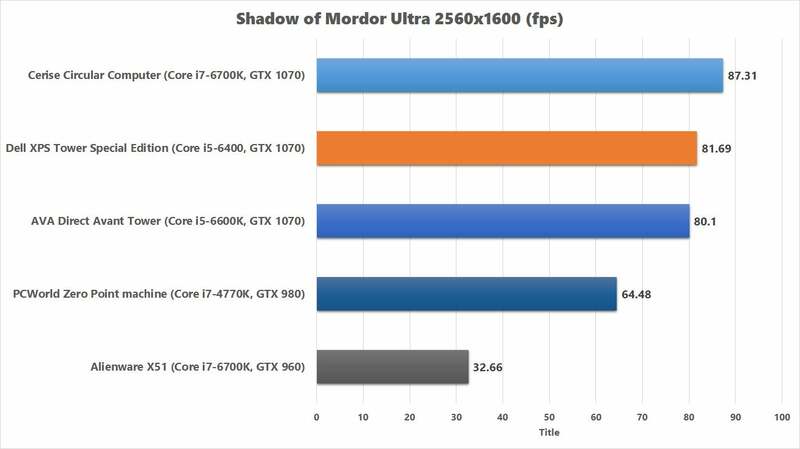 At a little over two years old, Shadow of Mordor can still clearly show the leap in performance between last-gen graphics cards and today’s Polaris and Pascal GPUs. We fired it up with the settings on Ultra and the 4K texture pack installed. That said, the XPS Tower still delivers a great gaming experience at either resolution. For context, our PCWorld Zero Point machine’s GTX 980 just managed to hit the golden minimum of 60 fps at 2560x1600, while the Alienware X51 (a more space-constrained desktop) eked out just over 30 fps. To ramp up the pressure a little more (and to see how the XPS Tower would do in a different game), we next fired up Rise of the Tomb Raider. This game’s a little over a year old at this point, but still gorgeous and plenty rough on a GPU. Like in 3DMark’s Fire Strike, the XPS Tower slips to the bottom of the GTX 1070 pack. 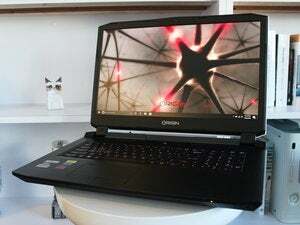 It’s about an eight-percent drop in performance relative to the Gigabyte PC, though in actual frames per second it’s not an enormous difference. You still hit that minimum of 60 fps. In comparison, our zero point machine’s GTX 980 falls below that threshold, while the X51’s GTX 960 (which was never really meant for 2560x1600 gaming, much less 2560x1600 on the highest graphics setting preset) struggles along. With gaming performance settled, we moved on to testing workstation duties. 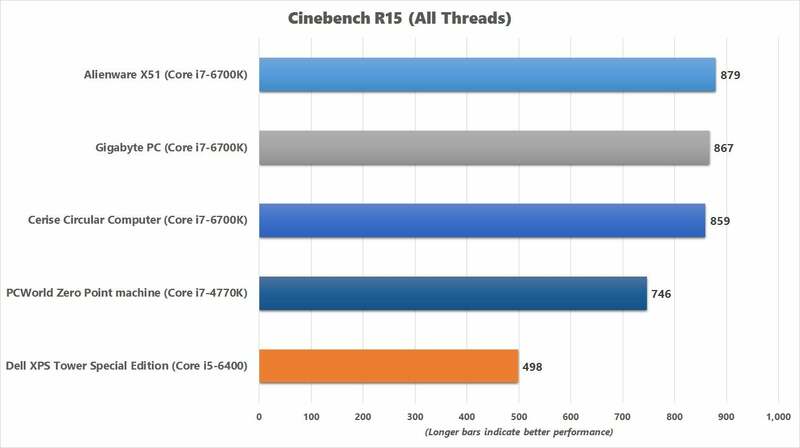 Cinebench R15 is a pure CPU test that tasks the processor with rendering a 3D scene using either one or all of the cores at hand. Like any good CPU benchmark, it takes advantage of everything a CPU has to offer, so more cores and higher clocks always work out better. With the Dell running a much more budget-minded chip than the rival gaming machines we’re comparing it to, we expect a more more modest outcome. Looking at the results makes us want to call an ambulance for the XPS Tower. Nobody was expecting it to pull off miracle performance, but even the Haswell i7 processor in our zero-point machine gave that i5-6400 (which is two generations newer) a good wallop. Overall, the XPS Tower will handle day-to-day tasks fine, but if you’re going to task it with heavier work that taps all of the CPU cores—it’s not going to outperform even older Core i7 chips. That point is also pressed in our next test. For an idea of how a system will perform during longer CPU-intensive tasks, we turn to Handbrake. It’s a free encoding program that relies entirely on the CPU and scales well with core count. For our benchmark, we drop a 30GB MKV file into Handbrake and then convert it into an MP4 file using the Android Tablet preset. 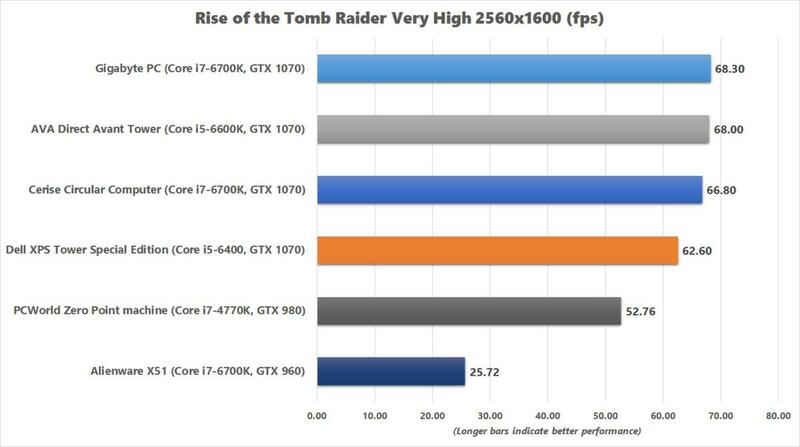 The more cores a processor has, the faster it goes. A system with a 10-core Broadwell-E chip can chew through this test in about 17 minutes, while a mobile processor can take up to two hours (as long as the system doesn’t throttle the clock speeds as the chip heats up). Because the XPS tower rocks a 65W processor that falls in the middle of that lineup, we expected its score to do likewise. While the Core i5-6400 can run at a boost speed of 3.3GHz when it means business, it hummed along at a steady 3GHz for this test. For context, that’s 1GHz slower than the Core i7-6700K in the Cerise build, and that CPU also has four additional logical cores. The difference in time between the two systems ended up being 26 minutes, which is substantial since the XPS took 64 minutes to complete the test. A more fair comparison is with the AVA Direct system, which has a higher-clocked i5 processor with the same number of cores but boosts up to 3.9GHz. That clock speed advantage allowed it to finish 20 minutes faster than the XPS Tower, so again, that faster clock does matter. If you plan to do any video encoding on this XPS and value your time, consider upgrading the CPU. The next model up in the product stack will set you back an additional $300, but it has a Core i7-6700 CPU, 16GB of RAM, and a 2TB HDD, so it’s a decent all-around upgrade. I have to admit, when I looked at this tower after opening it up, it seemed ill-designed for thermals. Air flow seemed restricted, and that huge power supply sits directly over the CPU. (It also seems to block the case’s only exhaust fan.) I was sure this puppy would run nuclear-hot if I pushed it hard enough...but I was wrong. This XPS didn’t lock up or show any signs of distress despite running Prime95 for hours. The CPU maintained a hot-but-comfortable 68 degrees Celsius the entire time. More impressively, the system made no noise whatsoever—it really is quiet and stable. Score one for big PC OEM engineering. I should note that this system does sport a 65W CPU, so it shouldn’t get that hot in the first place. Still, the air-cooler Dell installed worked quite well. On the GPU front, the GTX 1070 climbed to a maximum temperature of 82 degrees Celsius when we looped Unigine's Heaven 4.0 benchmark for a few hours. It ran at a steady 1,784MHz the whole time, too, which is above Nvidia’s listed boost clock for the stock version of this particular GPU. The XPS Tower Special Edition may not look like much, but if you’re looking for a no-hassle machine that’s VR-capable, upgradeable, and both quiet and stable from day one, it fits the bill. Speaking of virtual reality—Dell has positioned all of its Special Edition models of the XPS Tower as VR-ready boxes. So whether you choose the base configuration, which includes the RX 480, or upgrade to a GTX 1070 or GTX 1080, you’re good to go. Overall, the XPS Tower Special Edition is a bit like a Honda Accord. It might not give you a rush each time you look at it, but it gets the job done quietly and without any drama. About the only thing that would improve it is the option of an SSD for all configurations, not just the most expensive, but luckily, you can always upgrade the storage yourself. This gaming PC might not give you a rush each time you look at it, but it gets the job done quietly and without any drama.